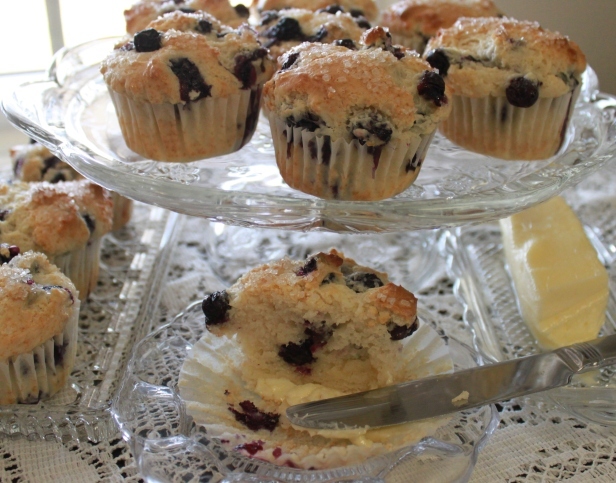 Blueberry Muffins | Rosetta Bakes! 1. Preheat oven to 350 degrees F. Grease a standard 12 cup muffin tin (or line with paper liners. 2. Whisk the flour, baking powder and salt in a medium bowl until combines. 3. Whisk the egg in a separate medium bowl until well-combines and light-colored, about 20 seconds. 4. Add the sugar and whisk vigorously until thick, about 30 seconds. 5. Add the melted butter in 2 or 3 additions, whisking to combine after each addition. 5. Add the sour cream in 2 additions, whisking just to combine. 6. Add the berries to the dry ingredients and gently toss just to combine. 7. Add the sour cream mixture and fold with a rubber spatula until the better comes together and the berries are evenly distributed, 25 to 30 seconds. Small spots of flour may remain and the better will be very thick. Do NOT OVER MIX. 8. Using a large spoon or cookie scoop sprayed with nonstick cooking spray, divide the batter amount evenly in each muffin section. 9. Bake until muffins are light golden brown and a toothpick or thin knife comes out clean, 25 to 30 minutes, rotating pan on oven rack halfway through the baking time. 10. Immediately remove muffins to a wire rack to cool for at least 5 minutes. 11. Serve immediately or at room temperature. 12. Store leftovers in an airtight container at room temperature. * Recipe from Brown-Eyed Baker, adapted from Baking Illustrated .